A campaign group is planning a lasting memorial to Welshman Archibald Dickson, Captain of the SS Stanbrook who rescued 2638 refugees from Alicante during the height of the Spanish civil war. Captain Dickson, who hailed from Cardiff, performed the rescue on March 19th 1939, and is revered as a hero in Alicante for saving the refugees – many of them women and children – from fascist forces. 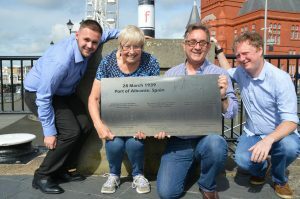 A special memorial plaque commemorating Captain Dickson’s heroic actions will be installed at the Cardiff Bay waterfront early next year, to coincide with the 80-year anniversary of the Spanish civil war. The campaign group includes Assembly Members Mick Antoniw and Vaughn Gething, members of the International Brigade Memorial Trust (IBMT) and Cardiff Councillors. “Wales made an important contribution to the Republican cause in the Spanish Civil War, both as part of the International Brigade and as seafarers, whose role was vital. “During our own difficult times we must never forget the importance of the rule of law and our commitment to human rights. The Spanish republic was a democratically elected government overthrown by a fascist rebellion with the support of German Nazis and Italian fascists. Later this year there will be a number of special commemoration events held in Cardiff October 13th – 15th which will be attended by the First Minister Carwyn Jones AM and feature contributions from Mick Antoniw and former MP Dr Hywel Francis, author of ‘Miners Against Fascism: Wales and the Spanish Civil War (2012)’ and others.